Close To My Heart is a company that allows their customers to discover their own creativity and preserve and share the moments of their lives that matter to them the most. For more than 25 years CTMH has been a proven leader in the scrapbooking and rubber stamping industry. Close To My Heart provides a sound business opportunity to the creative, the business savvy and the community minded since founding their business. Their direct sales opportunity is available nationwide in the US as well as in Australia and New Zealand. An excellent Hostess Program has been established to provide free and discounted products for having a home party with their CTMH consultant. I was sent a great collection of products from Independent Close To My Heart Consultant Roberta Stafford. What I love the most about this Sparkle and Shine scrapbooking kit is probably the fact that it’s all already coordinated for me. The CTMH scrapbooking kits really take the guesswork out of creating great works of heart by coordinating everything – all the way down to the sparkling embellishments. This is perfect for the not so creative minds or even just the people short on time. 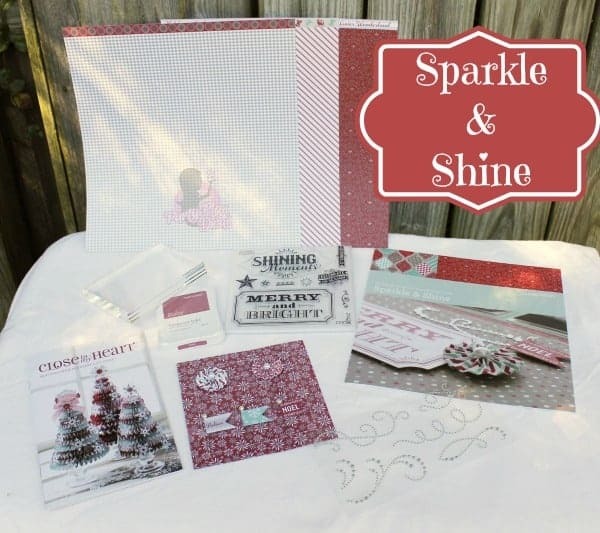 In the Sparkle and Shine kit there are enough supplies to complete at least 2 12×12 Scrapbook layouts with a complete instruction guide (with photo instructions). Using a few other products from the Close to My Heart product line I can complete the layouts as shown or utilize just the contents of the kit to create something beautiful to preserve the memories of our life. The Sparkle and Shine Scrapbooking kit includes a patterned paper pack, a My Acrylix Stamp set, color cardstock sheets, and embellishments. Using these pieces along with a few additional supplies I can create the layout but then use the remaining pieces of the kit to create additional layouts as well. CTMH even provides tips and techniques as well as a how to for the additional layout options or inspiration. I love having the guesswork taken out of the task of creating something so beautiful as a keepsake for my family whether for our family album or for placement in a frame for display. With the Close To My Heart products coordinating together it really does make it easy to complete a project in a short period of time. The My Acrylix stamp set even comes in its own storage envelope for when we aren’t crafting so they are protected in our craft box. Check out everything Close To My Heart has to offer by visiting Roberta’s website, and also check out her blog where she has tons of ideas for everything scrapbooking, card making, and more!